Delicately sweet and sour, acerola cherries are small-sized fruits of Caribbean origin. Botanically, Barbados cherry belongs to Malpighiaceae family of shrubs native to the Antilles, grow naturally in the wild in several parts of Central American, and Amazonian forests. 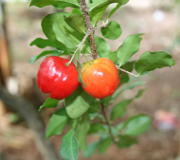 Some of the common names are Barbados cherry, West-Indian cherry, Amazon cherry, etc. Acerola cherries in a branch. Acerola is an evergreen large size bushy shrub that reaches about 8-18 feet in height. Its downy woody branches bear beautiful pink, lavender color flowers. Blooming occurs all along its leaf axils year round. Fruits are small-sized berries about the size of table grapes that appear single or in clusters along the entire length of its woody branches. The fruit features bright-red color, round or oblate shape, with tri-lobes which are more obvious at its bottom. Each berry measures about 1.5 to 4 cm in diameter and weigh about 5-7 g. Inside, the pulp is juicy with sweet and tart flavor and consists of three tiny winged edible seeds. Ripe berries are sweeter and juicier than that of immature, green skinned ones that can be consumed out of hand. Acerola is very low in calories. 100 g fresh berries provide just 32 calories. Nonetheless, they compose many health benefiting components such as vitamins, and pigment anti-oxidants that contribute immensely towards optimum health and wellness. The berries possess significantly high levels of antioxidants in comparison to some of other Amazonian fruits such as acai, abiu, wax jambu, etc. Poly-phenolic anthocyanidin compounds namely chlorogenic acid, ferulic acid, pelargonidin, malvidin, tannins, cyanidin-3-glycoside, quercetin, and kaempferol largely contribute to their antioxidant value. Acerola possesses highest content of vitamin C for any plant-derived fruits/berries, probably next only to another tiny-sized Amazonian berry, Camu Camu (2000 mg/100 g). 100 g fresh berries provide astoundingly 1677.6 mg of vitamin-C; that is about 1864% of daily-recommended intake. Eating as many as 2-3 would be sufficient enough to fulfill its daily requirements. Vitamin-C is an incredible natural antioxidant. Consumption of foods rich in vitamin-C helps the human body develop resistance against infectious agents and scavenge harmful, pro-inflammatory free radicals from the blood. The combination of vitamin C and phytochemical compounds in the Barbados cherry would help rid off harmful oxygen-derived free radicals from the body, and thereby, help boost immunity, protect the body from cancers, aging, degenerative diseases, inflammation, and infections. Additionally, research studies suggest that chlorogenic acid in these berries may help lower blood sugar levels and control blood glucose levels in type-II diabetes mellitus condition. The berries also contain a small amount of B-complex group of vitamins such as niacin, folates, and pantothenic acid. It contains great amounts of vitamin B-6, niacin, riboflavin, pantothenic acid and folic acid. These vitamins act as co-factors to help the human body metabolize carbohydrates, protein, and fats. Furthermore, they also contain an modest amounts of minerals and electrolytes such as potassium, manganese, copper, iron, and zinc. Barbados cherry grew primarily in home gardens as a decorative shrub and in some orchards in Florida and Hawaii in the US. Only a handful of farmer markets displays them for sale. Acerola extracts in the form of powder, concentrate, juices, etc., however, can be readily available in groceries. At their native wild, for example in the Brazil's Amazon, they can be readily available in the local markets. Choose bright red, ripe, firm, uniformly sized berries. Avoid discolored, soft, bruising, damaged ones. Once at home, store fresh berries in a plastic or zip pouch and place inside the refrigerator set at zero degrees and high relative humidity where they keep well for a couple of days. Fresh berries can be eaten out of hand from the trees just as you would do in case of other bush berries. However, their extremely tart flavor and proportionately large sized seeds would limit their use as a favorite table fruit. Once at home, wash berries in cold water without disturbing their stem. Drain and gently mop dry using a soft cloth/paper towel. Traditionally, acerola berries have been part of the food culture of native Amazonian since centuries. Sliced fresh berries can be added to fruit salad, fruit cup, etc. They can be used to prepare sauce, juice, syrup, jelly, etc. Acerola berries may rarely result in severe allergic reactions in some sensitized individuals. Most often, these kinds of reactions occur because of possible sensitization to latex from other products of the acerola tree. Persons with history of suspected allergy to these fruits may want to avoid eating them. (Medical disclaimer). <<-Back to Fruits from Acerola cherries nutrition. Visit here for impressive list of all variety of fruits with complete illustrations of their nutrition facts and health benefits. Phenolic compounds in Malpighia- Instituto de Química-Brazil (Link opens new window).